All exhibition cases need some form of relative humidity buffering to control and protect the enclosed contents from excessive RH changes. Our high capacity beaded silica gel is the best choice for controlling relative humidity within the 0-30% RH range. The beaded form offers low abrasion which greatly reduces breakage of the gel, thus producing far less dust and extends the service life of the gel. Silica gel is an amorphous, extremely porous form of silica. Its action in absorption and desorption of moisture is purely physical and there is no change in size or shape of the particle as it absorbs moisture. Our high capacity beaded silica gel is comprised of smooth beads 1/8” (2 - 4mm) in diameter with a mean pore diameter of 20-25 angstroms and has a specific surface area of 700-750 m2/g. Our high capacity beaded silica gel can absorb 40% of its own weight of water. The silica gel has an as shipped RH of approximately 0-2%. For a weight to volume reference, the bulk density of the gel is 47 lbs. per cu ft. or approx. 6 lbs. to a one gallon container. Standard White Silica Gel:This high capacity beaded silica gel remains unchanged in appearance when fully saturated. Mixed 80/20 Blue Silica Gel:This high capacity beaded silica gel is a cost effective mixture that will meet the needs of most applications where an indicating silica gel is needed. It is created using a mixture of 80% standard gel to 20% blue indicating gel. 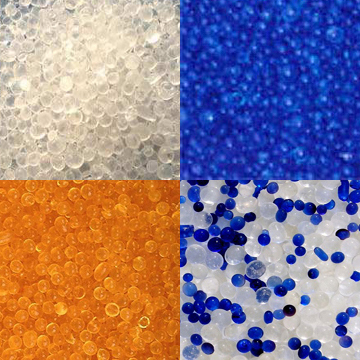 Mixed 80/20 Orange Silica Gel:This high capacity beaded silica gel is a cost effective mixture that will meet the needs of most applications where an indicating silica gel is needed. It is created using a mixture of 80% standard gel to 20% orange indicating gel. Blue Indicating Silica Gel:This high capacity beaded silica gel is made with cobalt chloride as an indicator. This dark blue color-change desiccant may be used whenever visual control of moisture is desirable. The degree of moisture uptake is indicated by a color change from blue to pink at 6% weight water loading. Orange Indicating Silica Gel:This high capacity beaded silica gel is a heavy metal free, environmental-friendly humidity indicator. This bright orange color-change desiccant may be used whenever visual control of moisture is desirable. The degree of moisture uptake is indicated by a color change from orange to a dark greenish/blue at 6% weight water loading. To control the humidity within a display case you will need approximately 0.5 - 1.0lb. of silica gel beads per cubic foot of air space. Quantity needed will vary depending on the display cases air exchange rate and many other factors.